Did you know that Lexington, North Carolina, is known as the Barbecue Capital of the World? In Lexington, October was officially declared "Barbecue Month" and the cycling event, the Parade of Pigs (also called the Tour de Pig), in the photo is part of the month-long celebration known as Barbecue Festival. If you didn't already guess, Lexington is famous for its barbecue. The city's first barbecue restaurant opened in 1919. Lexington barbecue is pork shoulder basted with "dip," a mixture of water, vinegar, salt, and pepper. It is cooked slowly over hickory wood until it is "fall apart tender." One pound of pork takes about an hour to cook. Today there are over 20 barbecue restaurants in Lexington. In the 1994 Barbecue Festival, 11,000 pounds of barbecue were served to more than 100,000 people. But eating isn't the only thing people do at the festival. 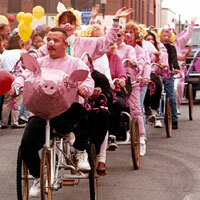 In addition to the Tour de Pig, there is Piglet Land, where there are rides and games for kids.